It's the LAST day of the blog tour! Thanks for coming along to meet Simply Charming Minis! Oh! I guess you are here already! I scheduled myself for the last day so I could see which pictures you hadn't seen. But you've seen them all! 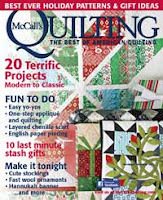 Well -- you will after you visit the Quilting Gallery anyway! I will tell you one story about making this book. Before writing this book, I have never tried to make a mini quilt. I have relatively large hands that aren't too dextrious. I thought for sure that my hands would be too big and clumsy to make a mini quilt. BUT mini blocks started soming back with Dear Jane and the Farmer's Wife, etc. Frankly, they intimidated me. I asked myself if I wanted to make some mini blocks, how would I do it? I started designing. 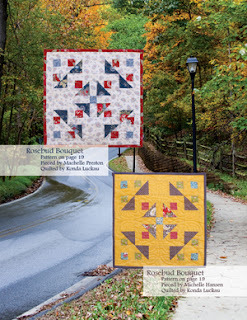 I designed mini quilts because I didn't want it to take me two years - or a lifetime - to finish! Then I tried making one of the quilts I designed. It was so fun! I was done making it before I had a chance to think twice about my decision! With some of the quilts, I used different techniques than I would a larger block. It made working with the small blocks easier. I still had the question - what would I do with all of these quilts! I answered this question in two ways. One, I would learn. 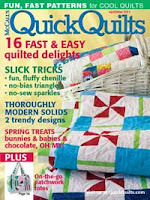 That is why I asked the ladies on the blog tour to tell you what they do with mini quilts. My second answer was my fall back position if I didn't end up learning a thing - which, of course, isn't the case - is I owuld use them for doll quilts. I have six kids. Chances are I will have grandkids. If nothing else works out, I will have a doll quilt for every grandchild! I have the perfect spot over my sewing machine that needs a mini quilt right away! Now to decide which one!!! Remember everyone's giving away a copy of the book and some of them still have the drawing open. Be sure to stop by them all! Since I'm on the list, I will be giving one of the books away too! 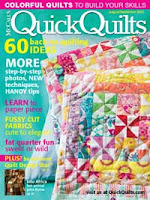 Enter to win by commenting on this post and telling me what you like to do with mini quilts. I will draw the winner Monday morning, Aug 6. Here is another page of pictures from Simply Charming Minis. This one shows Cherry on Top on the left and Flying around in Circles on the Right. The upper left quilt was the first one of the two of those quilts that was made. The name came from the center red squares. The bottom left is a more Christmasy version with green centers. Olive on top doesn't sound quite as fun though. My favorite part of Flying Around in Circles is the 16 patch in the center. 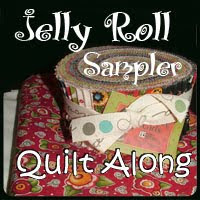 I think it's a great addition to lots of quilts. This pattern is fun to see the difference when you switch the lights and darks. Thanks for visiting! On the road again this morning heading home! And here is another picture from Simply Charming Minis! This picture includes the other In Love with Minis. To me it is a little more teenage version. The other two quilts are called Criss Cross Applesauce. On the traditional one, I custom quilted it as if it was a large quilt. There are straight lines through the diagonal chain and feather wreaths between. The batik version is already so busy that it actually has hibiscus flowers on it. I wanted it to look tropical! When I was a kid we sat Indian style. Now all my kids learn to sit criss cross applesauce at school - sitting cross legged. The name of that pattern came from my kids. Here's another page from Simply Charming Minis. The orange and blue ones are called Morse Code. I introduced it a few months ago on THIS POST. The other one is called In Love with Minis. That one really looks different in the two colors. I will post the other one tomorrow. It is so nice that computers are mobile these days. I am on an impromptu trip to visit my sister in Boise! See you tomorrow! 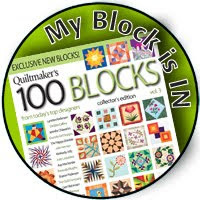 You can find out how we met - of course it's quilt related! - and see a few pictures from the book! Here's one more picture. 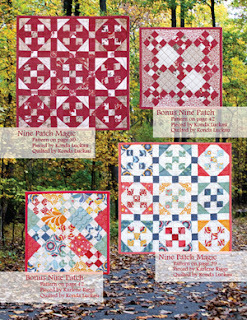 The two larger quilts (that are 17" square) are called Nine Patch Magic. The red one from French General Fabric by Moda was the first project that I came up with for the book. There are two things I like about this quilt: 1) I didn't use any funny shaped pieces. I used a couple techniques that made this small block really easy. 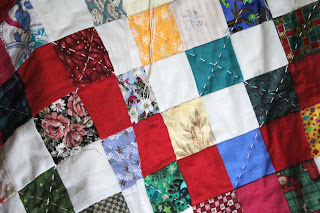 2) There were leftover nine patch blocks that made a really fun bonus quilt! 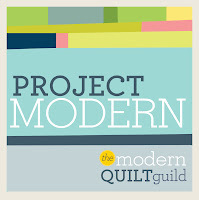 In case you were wondering, the other two quilts were made from Salt Air by Cosmo Cricket for Moda. That's actually another story. I had to use this fabric because when I was little, the Great Salt Lake was really cool! It isn't now. I loved going to the lake. The salt in the lake was suppose to make it so you could float. I actually didn't notice that. I was little. 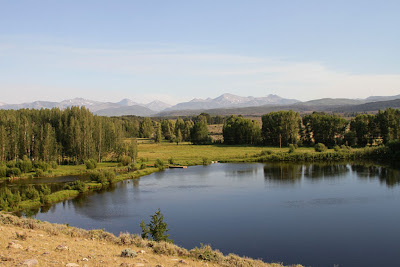 What I liked was that there was a long shallow part of the lake. We could run and play in the water without worrying about accidentally getting in over our heads. Salt Air was the happenin' place at the Great Salt Lake that has been destroyed and rebuilt several times. I think it actually is there now, but it isn't what it use to be. It represents the glory days of the Great Salt Lake. Aren't you glad to know that?!? I don't know if that is what Cosmo Cricket was thinking when she named her line, but that is what it meant to me! where she creates the word catoflauge! 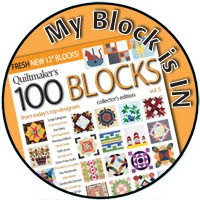 You have to read it to see what it means - and what it has to do with mini quilts! Here's another page from the book. These quilts are both Rosebud Bouquet. They are 13" square. 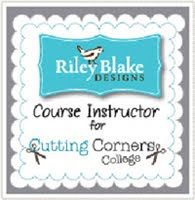 With the rosebud block, I use a different technique that I love! It makes them easy to sew despite the small size - 2" block. The background photo was taken in Maryland. I had a chance to go back and visit after having not been there for 20 years! The visit was surreal. We drove this street to school and back every day for three years. I never got tired of this part of the drive! I love having it included in the book. and see her version on Mini Baskets! You have to see her binding! Today is the 24th of July. In Utah it's a holiday - Pioneer Day - the day in 1847 when pioneers settled Utah and it was on it's way to becoming a state. It's easy to remember the date because there are "Days of 47" celebrations. 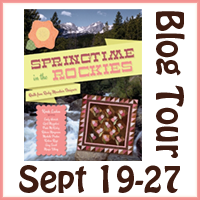 It's a fun day for me to kick off the blog tour for my new book, Simply Charming Minis. Now through the end of the month, we'll be giving away copies of the book. 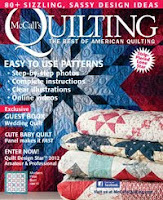 If you don't win or can't wait, ask for it at your local quilt shop or buy it online HERE. 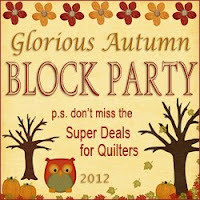 ALSO -- for my quilt along this fall, I have decided to do a Mini Quilt Along! The "It's a Mini Quilt Along" will start September 11 and run until April next year. We will be making one mini quilt every two weeks! 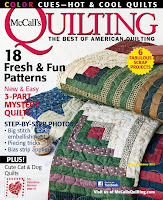 Three of those two week time periods will have special prizes just for getting the tops quilted! 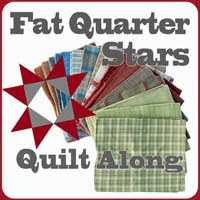 We will make 12 mini quilts by the end of the quilt along. There will be guest posters as always, but they will show you their version of one of the quilts from the book. You will need to buy the book to participate or borrow it from a friend, so I am giving you plenty of heads up! There are 32 quilts inthe book! Lots to see! Everyone on the tour is giving away a book so be sure to stop by!!! This past week I did something crazy. Something that kept me up until 3 in the morning twice! While I am a night owl, I'm too old to be staying up that late. Most of the time I'm smart enough not to try it because I know I'll pay for it the next two days. What kept me up? This year we got a bag of ninety-six 5 1/2" squares. After doing this for a few years, I wanted to really like this one. I decided to channel my quilting ancestors. 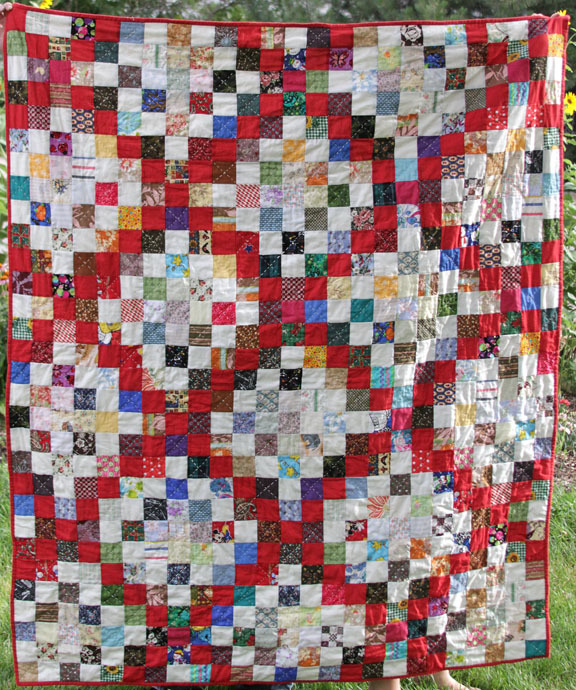 I picked a red solid and a white solid and made an irish chain style quilt. 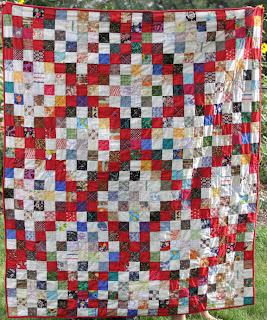 I supppose it was because of the channeling of my quilting ancestors that the quilt asked me to hand quilt it. I argued. I don't hand quilt. It didn't work. It had to be hand quilted. I bought crochet thread and embroidery needles and got started. 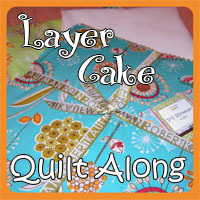 I used thin Quilter's Dream cotton batting, nice flannel backing, and spray basted it. I also didn't use a hoop. You can see from the picture above that I wasn't too critical of my skills. While I agreed to hand quilt it, that was the most I could commit to. When I got to the end of one thread, I couldn't lose my place so I threaded another needle and put a couple stitches in. Next thing I knew I was at the end of that thread and had another one threaded. Next thing I knew it was three in the morning! One interesting thing is that I have several kids who have claimed it. My nine year old says she likes it because it is unique. My four year old likes it because it has Mickey Mouse one it. My two year old likes it because it is soft. I think they like it because I was working on it around them. My four year old loved to "help" me pull the thread through. I love how it turned out! Thank you quilting ancestors! 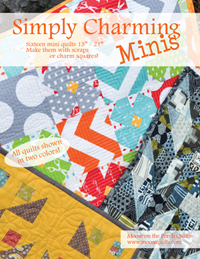 It's time to formally introduce my new book, Simply Charming Minis! There are 16 patterns in this book and all of them are shown in 2 colorways. That's 32 quilts! 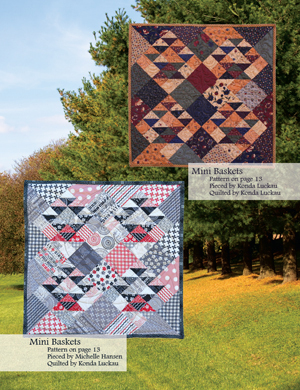 These quilts range in size from 13" to 21". They are mini quilts. I had so much fun making them. I was really surprised how much fun they were! To share more about the book, there's going to be a mini blog tour July 24 - 31. Stay tuned for more info and FREE books on the tour! A couple days ago I was playing in my sewing room when my 2 year old walked in. She picked up a mini charm pack - the 2 1/2" squares - of Kona solids that I had gotten at Market. This picture is from the Fat Quarter Shop. She picked it up and told me it was her quilt. 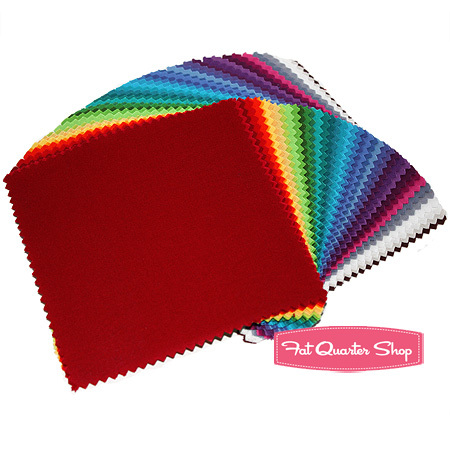 (She calls fabric quilts because she knows that is how it will end up.) I said I needed it first. Oh my! She really poured it on then. She said if she she couldn't have it then she would cry and she wouldn't be my friend and on and on. It was hard not to laugh. So I told her she could have it when I was done (what I didn't use) and gave her a kiss. She left and I set about seeing which ones I needed for what I wanted to do. I was going to quickly sew up a few of the leftovers for her, but she got side tracked so I let myself get side tracked too. The kids often lay claim to the fabric that comes in the door, but that one took the cake! Sometimes at parties "Get to Know You" games are played. I generally do not like these games. The one I despise is when they go around a circle and have you tell your most embarrassing experience. Really??? If I am going to tell you one thing about myself, why would it be something embarrassing? I know embarrassing things can sometimes be funny in hindsight. I suppose that is what game coordinators are going for. There was once something embarrassing and funny that happened to me, and I told myself I needed to remember that so I had a story to tell. 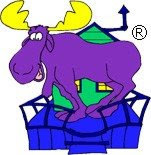 I have racked my brain for years to remember what it was. I don't have a clue. Embarrassing stuff happens all the time - mostly because I'm and idiot. Case in point - this blog. I am so embarrassed that I haven't posted in so long that I am frozen - not in fear - but in embarrassment. Today I finally told myself to get over it already! So here I am. I once heard a saying something to the effect of: Take the easy way out. Just do it! The point was that it is easier to just do something. The longer you wait, the harder it gets because you get so worked up about it. 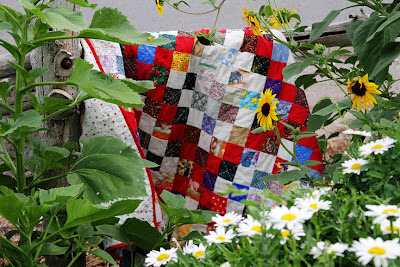 At first, there might be a real reason not to have done something, like not blogging because of being in charge of a quilt show and the kids being home for summer and mini vacations with the family. At some point it stops being a reason and turns into an excuse. What do you do to break out of the "frozen" mode? Is there a secret pill? P.S. The picture has nothing to do with this post. It is where I spent the 4th of July. I should tell you more about it another day.